Creating business plan with free templates and examples. Business plan design has never been easier. A business plan is a statement of business goals and plans for reaching the goals. It may also contain background information about the organization. A Business Plan is very crucial for starting and running your business successfully. Good business plans can help you keep on track toward your goals, and provide a reference for benchmarking, reviewing results and making adjustments in your business. Good business plan involves with visually-pleasing charts and graphics. As an all-in-one diagramming maker, Edraw contains a great diversity of business diagram templates available for making business plans. 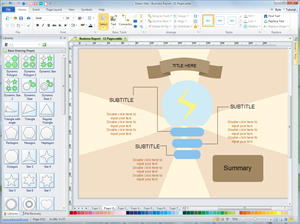 You can easily editing texts, insert pictures, and layout through easy-to-use tools. It's definitely the most practical and convenient business plan assistant. We have chosen an exquisite business plan example for your reference. Click the picture to download and modify for your own use. 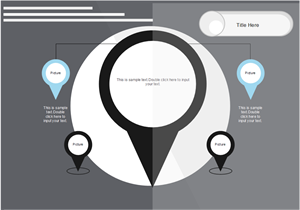 A gray theme business plan example is readily available in vector format. Anyone could download and use for your own designs.